IT'S MONDAY- WHAT ARE YOU READING? All I can say about CROSSOVER, by Kwame Alexander, is man, oh man, do I wish I had had this book a few years ago, when my boys were in middle school. 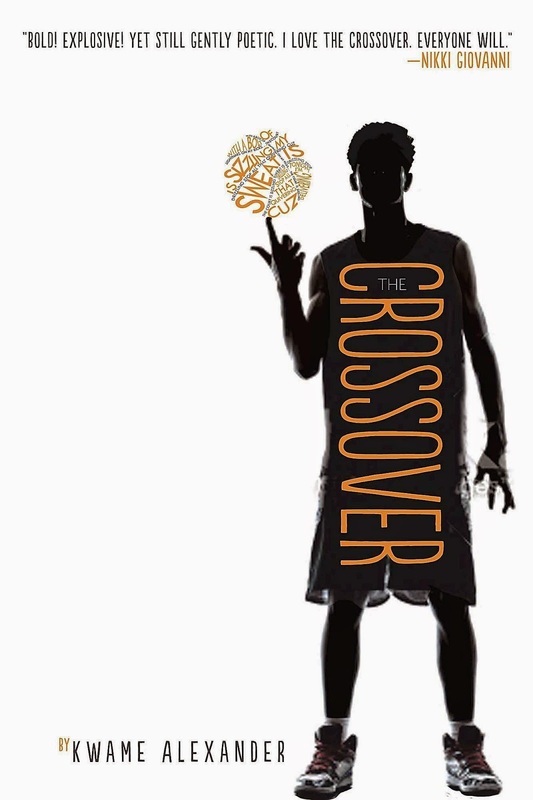 CROSSOVER is a novel in verse, the story of two basketball playing brothers, twins, Josh and Jordan. Their dad is Chuck, (Da Man) Bell, a former European league champion. Their mom is the assistant principal at the school the boys attend. Kids from fifth grade all the way through middle school are going to love the rap-type poems. Can't wait to pass it off to some of my middle school, "I don't read" guys! Perfect! 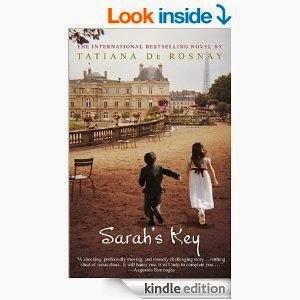 In the car, I've been listening to SARAH'S KEY by Tatiana De Rosnay, which I thought was fairly new, until I went to look for a cover for this review, then I discovered it's been out quite a while, so long, in fact, that it is already a movie. SARAH'S KEY is a Holocaust novel, about the Vel d'Hiv Roundup, in which thousands of Jewish families were arrested, held at the Vélodrome d'Hiver outside the city, then transported to Auschwitz. The story is told in alternating chapters- one featuring Sarah Starzynski, a Polish girl living in Paris, whose family is part of the roundup, and the other about Julia Jarmond, an American journalist, married to a Frenchman, and assigned to cover the sixtieth anniversary of the roundup. Julia discovers that her life and Sarah's are linked through a tragic secret. This is another sad, sad part of the Holocaust that I knew nothing about. The audiobook is really well done. Buffy Silverman has the Poetry Friday roundup this week. 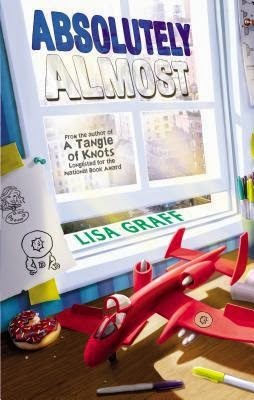 A couple of weeks ago, I read a review of ABSOLUTELY ALMOST somewhere. It sounded interesting, so I immediately put it on hold at the library. It came in this weekend. Interestingly, ABOLUTELY ALMOST had its own little publicity campaign on Facebook and Twitter. I was glad, then, that I had already reserved it, because I bet it would be hard to get now. When the book opens, ten-year-old Albie has just been kicked out of an exclusive New York City prep school, because he simply isn't able to perform at the required academic level. Enrolled in the public school in his neighborhood, Albie discovers he still is not smart enough. He is required to go to "Math Club" (remedial math) every day. He can't pass the spelling tests. His only friend is a girl named Betsy, who stutters. And his parents and grandfather are all over him because he isn't meeting their expectations. At the same time, Albie is a really good kid, a kind and caring kid. His babysitter, Calista, is the first person to point that out to him. ABSOLUTELY ALMOST is a quick read. The chapters are short, mostly not more than a couple of pages, so it would be a great book for a kid who wasn't a super strong reader. At the same time, it's a really, really good story, with lots to talk and think about. I think I'm gonna have to buy this one! I have been teaching about five years. that works with high school. "I really don't like long distance driving,"
We miss a turn and make a two hour detour. He finally catches up with me in Seattle. how hard the drive has been. Now I am back to Young Life. Keep us in your prayers! Lots of celebrations in this this week's Poetry Friday posts! First, head to Catherine Flynn's blog, "Reading to the Core" (earlier today I mistakenly confused Catherine Flynn with Catherine Johnson- my apologies to both ladies!). Listen to actor Charles Durning's recital of "Carentan, O Carnetan," written by Louis Simpson, a soldier in WWII. It made me cry. Mayer commemorates D Day with Yvor Winters' stark, "Night of Battle" at Kurious Kitty's Kurio Kabinet, then move on to Random Noodling and read three original D Day poems from Diane's other website, Random Noodling. Diane also has a great Yvor Winters' quote about writing at Kurious K's Kwotes. My fellow Denver friend Linda Baie (who I met through kidlitosphere, but actually lives about ten minutes from me), but is celebrating the end of the school year with an original poem, "Outta Here!" At the Poem Farm, Amy Ludwig Vanderwater not only has an original end of school poem, "Last Day," but also shares a terrific guest post about themed student anthologies. I am soooo going to try this idea next year! Laura Shovan (Author Amok) also features student poets. She's just finishing a residency at Northfield Elementary. This week's post features "Pocket Poems," but her posts includes ten more links to student poems. Carol Varsalona, the very last poster this week, is wrapping up her school year with a post remembering her first year as a teacher. She captures, I think, so many of our hopes and dreams! Greg Pincus celebrated a totally different holiday yesterday. Warning, his poem, Doughnuts Oh, Doughnuts! will make you crave "fried circles of yum" all day! Greg needs to talk to Joy, who is also celebrating doughnuts at Poetry for Kids. Joy has been busy making Poetry Boxes, which seems like an idea with distinct possibilities for teachers. Happy Anniversary to Tara, who is celebrating her 27th wedding anniversary with a new-to-me e.e. cummings poem, "love is more thicker than forget." Children's author, Tamara Will Wissinger, and a ragtag band of cowboys are celebrating the release of their first poetry picture book, THIS OLD BAND with a book giveaway! Congratulations, Tamara- definitely cause for a huge celebration!! This week, Laura's post celebrates the natural world with Joanne Lindens"Curly-leaf Pondweed," Linden's new book, FIDDLEHEADS TO FIR TREES, looks like a book I definitely want to own! Michelle Heidenrich Barnes puts the spotlight on Sylvia Vardell and Janet Wong's POETRY FRIDAY SCIENCE ANTHOLOGY in an interview that made me laugh! I'd love to dine with any of these ladies any time! April Halprin Wayland celebrates a brand new poetry book THE POEM THAT WILL NOT END: FUN WITH POETIC FORMS AND VOICES, by prolific poet, Joan Bransfield Graham, with an interview. Almost every week, I read a post that makes me think, "Hey, that used to be one of my favorite books! Where is it?" This week it was Myra Garces Bascal's post of "Headstrong Boy," which she found in Naomi Shihab Nye's collection, THIS SAME SKY. At No Water River, Renee LaTulippe and Lee Bennett Hopkins have their sixth post highlighting NCTE Poets. This week's poet is longtime favorite John Ciardi. Renee says, "This series isn’t about analyzing the poets and their work, but rather about preserving Lee’s personal recollections, insights, and memories of each of these amazing people." Lorie Ann shared YOU MEAN THE WORLD TO ME, a perfect poetry book for young readers. Violet Nesdoly has an original poem, "Walk the Beach," that makes this land-locked sea lover long for beach time. I agree with Jama, who thinks Richard Michelson's book, S IS FOR SEAGLASS, would be a perfect companion to HAVE YOU BEEN TO THE BEACH LATELY? Jama, ever the gourmet goddess has a really fun recipe for flip flop cookies. 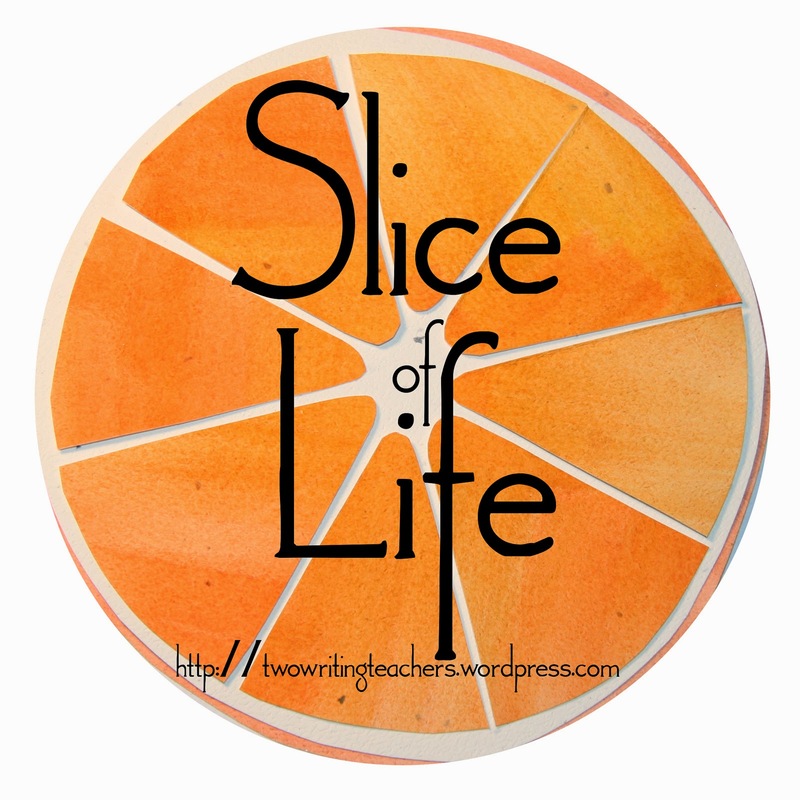 For those of you who are still teaching, this would be a perfect end-of-the-year treat! Lorie Ann Grover uses an original photograph as a jumping off point for writing haiku, "A Flowered Conjunction." Charles Waters found time for a really meaty post, even though he's preparing for a move to New York. His poem, "Sack Lunch," is featured in a really important article on the role of poetry in the Common Core. Charles links with Diane Mayr and Jane Hulstrunk, at a new-to-me website, Spark, which pairs writing and art. Charles ends his post with an original lullaby, "Dreamtime Boulevard." Kelly Mogk isn't undergoing any significant life changes, (that I know of anyway), but I'm adding her link here because Stephen Burt'sTED talk, "Why We Need Poetry," seems like a perfect companion text to Charles' article about the role of poetry in CCSS. Robin Hood Black, fresh from a move to South Carolina, offers news of a poetry contest. Her post made me want to go buy a bike. Dori has opened a yoga studio, but assures us that she will be back to poetry very soon. Maybe you could read poetry at your yoga classes on Friday, Dori! At Drift Record, Julie Larios has Wendell Berry's, "The Peace of Wild Things," an important reminder for all of us worriers in the crowd. Mary Lee has another big life truth poem, "Sonnet I," by Phillip Britts. Little Willow shares a big truth from Marilyn Monroe. I think it would be interesting to juxtapose this poem against one of her blonde bombshell pictures, then write about it. Karen Edmisten has had a traumatic few days! She celebrates the wonder of connection with "From the Telephone," by Florence Ripley Mastin. At, "There is No Such Thing as a Godforsaken Town," Ruth is slowing down after a busy school year. 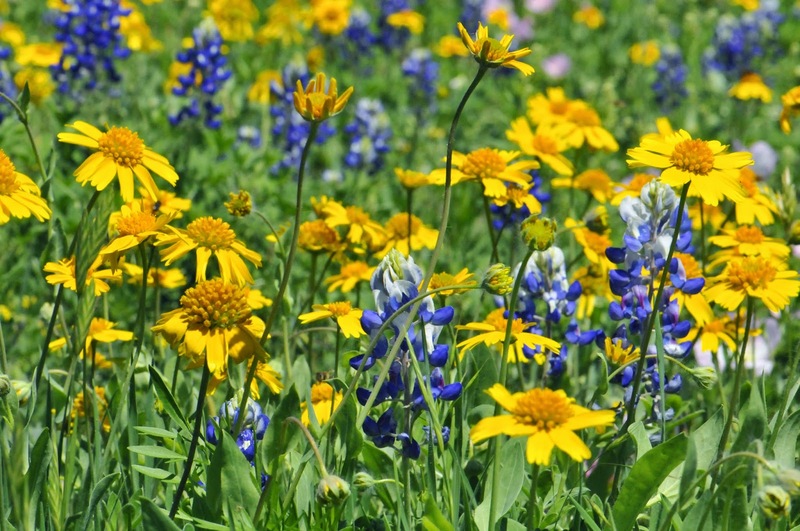 She shares excerpts from Australian poet, Mark Tredinnick's "Eclogues." You can listen to Mark read his work here. If I left anyone out, it was purely accidental! Let me know and I will fix it immediately! Hurray! You found it! The Poetry Friday Roundup is here! You've probably already been to Catherine Johnson's blog and discovered that we switched weeks. About two weeks ago, I was asked to accompany a group of sixty middle schoolers to San Diego. We'll spend a day at the beach, probably the first time for many of our inner city, never been out of Denver travellers, then head to Ramona, California for six days at a Young Life camp. It probably won't be the most restful "vacation," but it will be a lot of fun! Because I won't have access to wifi while I'm at camp, Catherine graciously agreed to trade with me. 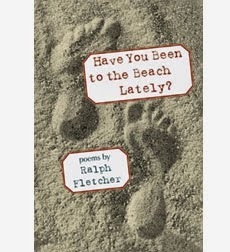 In honor of my upcoming adventure, it seemed a perfect day to choose a poem from one of my favorite summer poetry books, "Have You Been to the Beach Lately?" by Ralph Fletcher. You probably already know Ralph's work, but just in case he's new to you, he often chooses a theme, e.g. the beach, and then builds a series of poems around that theme. Each of the poems can stand alone, but they are also connected to each other, and tell a kind of a story. Have You Been to the Beach Lately? captures a not-quite-teen's beach trip.